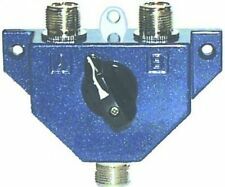 MFJ-1702 2 POSITION COAX SWITCH - USA Seller - Authorized MFJ Dealer! VINNANT COL1090/5-H. tuned for 1090Mhz. Can be used for receiving aircraft transponder on 1090mhz ADS-b signal. swr 1.5:1 or better at 1090Mhz. Make sure antenna is placed as high as possible with no nearby objects at least 50cm away from the antenna.Antenna need to be on the top of the pole and cannot be placed in the middle of the pole,unless you use the orizontal stand-off arm. Tuned for 1090Mhz. Can be used for receiving aircraft transponder on 1090mhz ADS-b signal. swr 1.5:1 or better at 1090Mhz. Make sure antenna is placed as high as possible with no nearby objects at least 50cm away from the antenna.Antenna need to be on the top of the pole and cannot be placed in the middle of the pole,unless you use the orizontal stand-off arm. For USB SDR dongles or profesional boxes. LORA/LORAWAN systems 868. ADRUINO 868 SHIELD. swr 1.2:1 or better at 868 Mhz. antenna is tuned for good swr using pro antenna analyzer. antenna is designed for RX and TX as well. Neues Angebot80 - 6m Mulitband End Fed Long Wire Antenna . . Sealed weatherproof box Usable Frequency Range 160m to 6m. Handling 300 watts the antenna is targeted at QRP to 200 watts rigs with a stealth antenna for restricted Housing regulations. 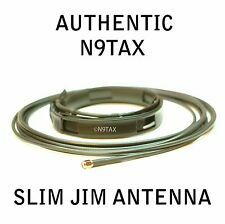 Antenna provides excellent performance for the ham who wants a bit more out of their antenna. Center point: VHF 144mhz and UHF 435mhz. Can install to the antenna base station directly. 1X dual band antenna. Dual band, high gain! Gain: 2.5/3 dB. Dual Frequency 400-470MHZ and 136-174MHZ. VSWR: Below 1.5. 7 sections telescopic antenna aerial.Mainly used in television, radio, electric toy, remote control, lamps and lanterns, VCD, and other special configuration communications antenna and iron and tools antenna and other electronics products.Great replacement for your damaged TV antenna or FM radio antenna!Sections : 7 SectionsUnstretched Size : 175mm / 6.7"";Full Length : 98cm / 38.5""Max Diameter : 7mm / 0.27"";Mounting Male Threaded Hole Diameter : 3mm / 0.11""Material : Stainless Steel, Brass;Color : Silver Tone Weight : 22g;Package Content : 1 x Telescopic Antenna Brand Unbranded MPN Does not apply UPC 4894462098424 EAN 4894462098424 ISBN 4894462098424 Designer/Brand Unbranded UPC 4894462098424 EAN 4894462098424 ISBN 48944620984. Sirio CX 440 - Omnidirectional Base station 446 antenna. 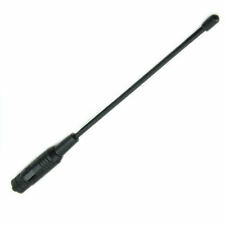 A good quality base antenna ideal for use on the PMR446 band. • Base station antenna, Mono-band. Wide bandwidth - the antenna can be used from 440-455MHz with no tuning required. Technische Daten 1:1 Balun. ab 9 Mhz bis 30 Mhz > 30 dB. Eigen SWR 1 - 30 Mhz (50 Ohm Abschluss) < 1,5. bei 3,5 Mhz > 20 dB. This is a small LF and HF reception only active antenna, great if you are limited by space. Excellent solution when it is difficult to install a half-wave dipole or you want to avoid potential objections from your neighbours. How this works is really quite simple. That's way too much for a tuner to handle right?. Are you looking for a quick and convenient way to run a portable dipole without needing 2 or 3 supports or several antennas for portable or permanent operation?. Tuned at center for 446Mhz. 446Mhz PMR band. SWR 1.2:1 or better at 446Mhz. It is a dipole antenna. 446.1-446.2 DMR band. This antenna is using N connector. Antenna provide gain and increase the coverage. Walkie Talkie Type: CarMaximum Range: Less than 1.5kmType: AccessoriesFrequency Range: VHF UHFTalk Range: depend on radioStorage Channel: depend on radio1. All of our items are Brand New.2. Model: RE-02.3. Frequency: 10-1300MHz.4. Wide range of applications.5. It can effectively enhance the signal.6. Connector: UHF- Female TO UHF-P/M.7. Weight: 90g.colour: BlackMaterial: ABS Metalsize: Length of antenna: 10cm X 3(uhf) and 15cm X 3(vhf)Package Contents: 3 x Short Gain Rod3 x Long Gain Rod1 x AdapterOnly the above package content, other products are not included.Note: Light shooting and different displays may cause the color of the item in the picture a little different from the real thing. The measurement allowed error is /- 1-3cm. .
Aside from that, the circuit is much like the others. The combined signal is then buffered by Q4 and sent to the receiver through a relay. In transmit mode, the relays serve to isolate the QRM device and allow the transceiver to be connected directly to it’s antenna. MCR COMMUNICATIONS G5RV FULL SIZE. This G5RV Full-Size HF Wire Antenna is an HF Amateur Band, Receive and Transmit Antenna. The ribbon cable should hang downwards as it forms part of the radiating antenna. 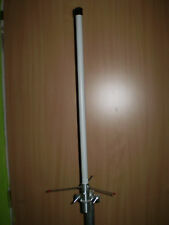 Up for sale CASED version of my "white", well known MiniWhip Active Antenna. This sale includes theMiniWhip andPower Splitter assembled, tested and CASED. This new version of PA0NHC based MiniWhip (red e signed for SMD parts and better performance) Antenna has these features. SIRIO GAIN MASTER als 1/2 Wellen Ausführung (Halbwelle). 27.2 - 30 MHz tunable. Sendeleistung / Power. Gewicht / Weight. PL Buchse (SO-239). Länge / Length. Antennenanschluss / Connection. This pole is not suitable for hard-drawn copper wire dipoles and doublets (for instance standard G5RVs) because that type wire is too heavy. I soldered the coax directly to the wire to cut any weight down at the feedpoint and used Aircell 5 coax (very light but similar spec to RG213) to good effect. Long Wire Receive Aerial, 100kHz to 30MHz with PL259 or BNC. Made in Dorset UK. The earth cable is fitted with a large crock clip to be connected to a convenient earth such as a central heating radiator. Portatili tipo Baofeng UV-5R / UV82 e similari. Connettore: SMA - F (Femmina). FEMMINA Dual Band Vhf Uhf. di accessori per portatili. Antenna di ottima qualità. Frequenze: VHF/UHF (dual band 144-430Mhz). The EU1KY antenna analyzer V3 is an open source project to build your own, reasonably cheap but very functional antenna analyzer that is a handful tool for tuning coax-fed shortwave ham radio HF/VHF, and CB antennas. It is ideal for long range point-to-point operation in the 5 GHz - 5.8 GHz Wi-Fi Band. The antenna's precise beam pattern and excellent front-to-back ratio help reduce unwanted interference. This antenna provides full 5 GHz - 5.8 GHz band coverage (4900-5850 MHz) making it ideal for use with 5 GHz access points and wireless video systems, as well as 4.9 GHz Public Safety Band networks. It is a perfect match for 802.11n MIMO access points and bridges including Ubiquiti Rocket® M2 and Rocket® Prism 2AC, MikroTik BaseBox® 2, TP-Link WBS210 and Cambium ePMP™. MIMO Applications, 2x2 MIMO. It is ideal for long range point-to-point operation in the 2.4 GHz Wi-Fi Band. The antenna's precise beam pattern and excellent front-to-back ratio help reduce unwanted interference. It can be installed for either vertical or horizontal polarization. These were made for Relm wireless by M/A COM. This is a new in the box MFJ 1778 G5RV Antenna. The MFJ-1778 (G5RV) consists of a 102 foot flat top fed with a 32.5 foot 450 ohm matching section ending in an SO-239 coaxial connector. Only US funds accepted. MFJ-1778 G5RV, WIRE ANTENNA. G5RV, WIRE ANTENNA. 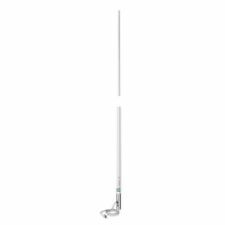 The G5RV antenna is a multi-band center-fed dipole antenna capable of 1500 Watts. The MFJ-1778 (G5RV) consists of a 102 foot flat top fed with a 32.5 foot 450 ohm matching section ending in an SO-239 coaxial connector. As described and got here fast! For great HF antennas.it’s HFEDZ! - This antenna works great! 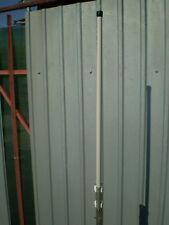 For sale here is an end fed antenna designed for 10m-160m. NEW 200W VERSION! Easy and fast installation. You are purchasing (1) new MFJ-918 - 1:1 ratio 50-Ohm, 1.8-30 MHz, 1.5 kW current balun. This is designed to replace the feed-point insulator on wire antennas and provide balun protection. NMO150/450/758 - Pulse Larsen Tri Band Antenna with Spring, NMO. VHF:150-174 MHz. UHF: 430-520 MHz. 7/800: 750-870 MHz. Omnidirectional antenna. Tri Band Monopole. Flexible Spring, Impact Resistant. Your Friends at Wiscomm are here to help. VHF Hand Held Radios. VHF Base Antennas. UHF Hand Held Radios. UHF Base Antennas. Bandwidth >1.5 VSWR 4 MHz (VHF) / 10 MHz (UHF). Specific Freq. (MHz) 144-148 & 440-450 MHz. Rated Wind Velocity (MPH) 100 MPH. Magnetic loop antennas are known for their relative efficiency when compared to their physical size, and are known for being "quiet" on receive compared to many other antennas, especially dipoles and verticals. Rust-free stainless steel is employed in major component parts making the antenna rust resistant and durable. •Ultra-wideband design 25 to 1300 MHz receive, 50-1300 MHz transmit (6m tunable for transmit). DUAL CORE improves power handling! Most HF ham bands can be tuned by the tuner in your radio. NOTE: to tune all HF ham bands an external tuner may be required. ALL BAND HF ANTENNA. Antenna Features. The radials lay out does not need to be in a perfect spoke pattern or have to be straight (see below), the lay out can be in any pattern (to work in your mounting location) although the radials should not cross each other. THIS NOT FOR THE TRUCKER STYLE ANTENNA! FireStik FG4648-B 4 foot No-ground plane CB antenna kit (Black). Firestik 4' (61cm) Single Mirror "NGP" Kit Complete (Black). ANTENNA: The antennas used in these kits is altered in order to maintain a desirable center band position when used with the tuned coaxial feedline. CDE /CD-44 ANTENNA ROTOR AND CONTROL. Dual ferrite bead 9:1 unun for end fed longwire New! Bonus "mono" bead included.